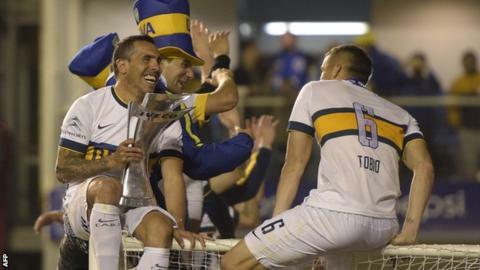 Argentina striker Carlos Tevez has inspired Boca Juniors to the Argentine Primera Division championship, his eighth league title in four countries. Tevez re-signed for Boca in June after winning titles in Brazil, England and Italy with Corinthians, Manchester United, Manchester City and Juventus. Boca won 11 of 14 matches after the 31-year-old returned to his boyhood club. "I've won championships in many places but nothing compares with this," said Tevez, who also played for West Ham. Boca were crowned champions with a match to spare as they beat Tigre 1-0 on Sunday. After Tevez, who has 74 caps for his country, helped Boca claim the 2003 title, he had a league-winning spell with Corinthians. A high-profile transfer to England with West Ham followed in the summer of 2006, before the forward moved on to Manchester United, Manchester City, and then Serie A side Juventus. With United he won two Premier League titles and the Champions League, there was a third league crown with City, before he helped Juve lift the 2013 and 2014 Scudetto in Italy.